Melanie Jackson’s work has often revealed a curiosity with reductivist representations of big ideas (Root Entry, 2006) or otherwise seemingly simple stories that might disclose more complex international relationships or concerns (Some Things You Are Not Allowed To Send Around The World, 2003; A Global Positioning System, 2006). In Jackson’s short, animated film International Fauna this focus is turned toward those animals of all states – living, extinct or mythical – that are called upon to perform as national symbols. Crudely lifted from their original settings on plinths, flags, publications and memorabilia these creatures still unwittingly testify to their origins: they are liberated yet somehow still trapped. Albert Einstein once stated that ‘Nationalism is an infantile disease… the measles of mankind.’ Aptly enough, International Fauna returns the car bonnet ornaments of nationalism to the infant’s playground with the infectious zeal of a viral video. In doing so it begins to reveal the syntax of the animal as national symbol. Birds, reptiles, mammals, amphibians are all forced to take unnatural, idealised poses. Horses show boat, tigers pounce, peacocks shimmer, parrots stare coyly over their shoulders, crocodiles open wide their jaws. These images are hybrids. They not only bear the appearance of the original animal they also testify to a nation’s self-image, its aspirations to the nobility, prowess, wisdom, power, and so on which the animal represents. International Fauna raucously tips these ambitions into absurdity with a collaged soundtrack of real animal cries and calls. Each sound is reduced or stretched to the length of the animal’s image, creating a form of musique concrete that holds the menagerie together. This affected audio reproduction echoes and exaggerates the boiled-down confection of the emblems. Cf. Christel Lane, The Rites of Rulers, (Cambridge: Cambridge University Press 1981). Karen A. Cerulo, Sociopolitical Control and the Structure of National Symbols: An Empirical Analysis of National Anthems, (New York: State University of New York 1995). 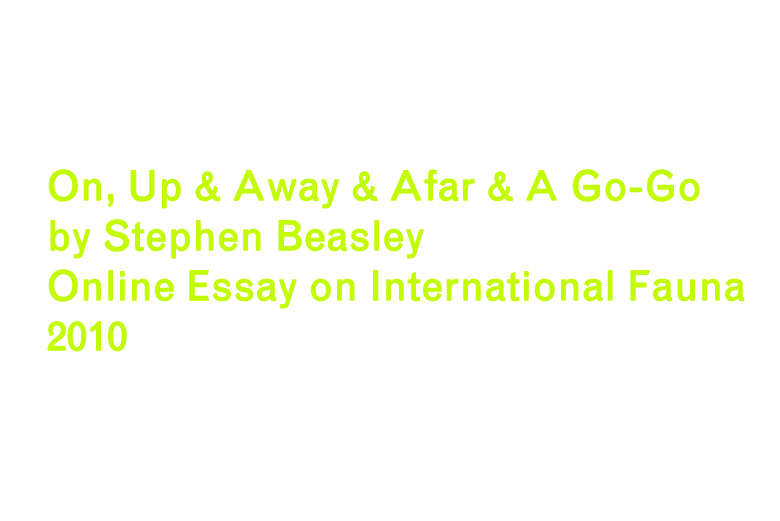 Stephen Beasley is an architect, artist and writer based in London. He co-founded the multi-disciplinary practice FlatPack001 in 1999 with his brother Mark Beasley. Recent work includes FLUFFERS II, published as part of Celine Condorelli’s Support Structures, the exhibition design of group show Sudden White at the Royal Academy, and the experimental radio play ADVENTURE: Showdown at the Pig Palace, released by Junior Aspirin Records. He is currently a senior project architect at Manalo & White and a contributor to Frieze magazine.